Why type when you can dictate to your Mac? I’ve been using speech recognition software for nearly 20 years, first experimenting with IBM’s ViaVoice, which required you to speak one word at a time. Over the years, I have watched as the software has improved, offering continuous speech recognition, and honing the accuracy of the speech recognition engines. The only major player for OS X is Nuance’s Dragon (formerly known as Dragon Dictate). Now at version 5, Dragon offers some of the biggest changes since this software was first introduced, both under the hood and on the screen. Speech recognition software has long required that you use a specific type of microphone. I have looked at this type of microphone in a buying guide from 2011, and a more recent look at some wireless microphones. One of the biggest changes in Dragon 5 is that the software now supports internal microphones on Macs. Recognition is better with a microphone specifically designed for this usage, but in my testing I found that, in my quiet home/office, accuracy was excellent using the internal mic on my Retina iMac. The most visible change in Dragon 5 is the slimmed-down interface. Dragon is now a headless application, which you access by clicking a menu bar icon. It has a small status window which you can use to control the microphone, pick from multiple options when making corrections, and getting some information about what you can say. As such, Dragon gets out of the way, letting you focus more on the text you are dictating. The Dragon status window is all you see onscreen. Here I’ve told Dragon to correct a word. Nuance says that Dragon’s accuracy has improved. It’s fair to say that each version of the software offers improvements in accuracy, and with version 5 it does feel a bit more precise. Nuance explained to me they have rewritten the speech recognition engine, and one of the biggest differences is the high level of accuracy out of the box. 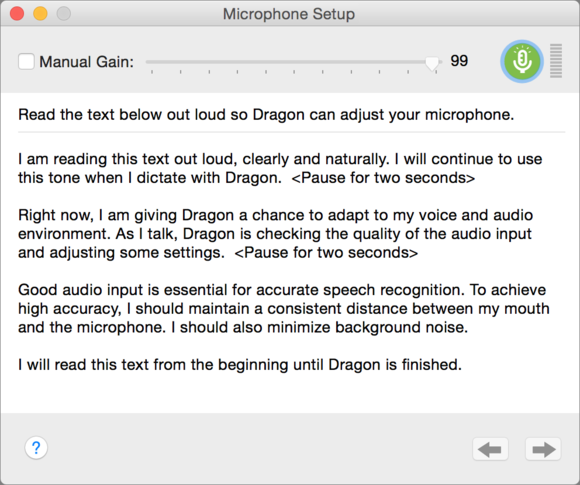 Dragon learns from your voice when you perform an initial microphone volume calibration—Dragon has you read for about 30 to 40 seconds to set the volume of your microphone—and, while using the app’s Voice Training feature improves recognition, Dragon’s ability to start correctly transcribing your voice immediately, and as efficiently as it does, is a huge step forward. Dragon’s Microphone Setup may be all you need to start dictating. Another element of the new headless Dragon is the fact that you no longer need to type in the Note Pad that was available from within the application. Dragon is happy to type in any app: I use it in word processesors and text editors, Apple Mail, Messages, Twitter clients, and more. Dragon offers the same level of accuracy in every app. Naturally, recognition improves over time, especially if you use a unique vocabulary. 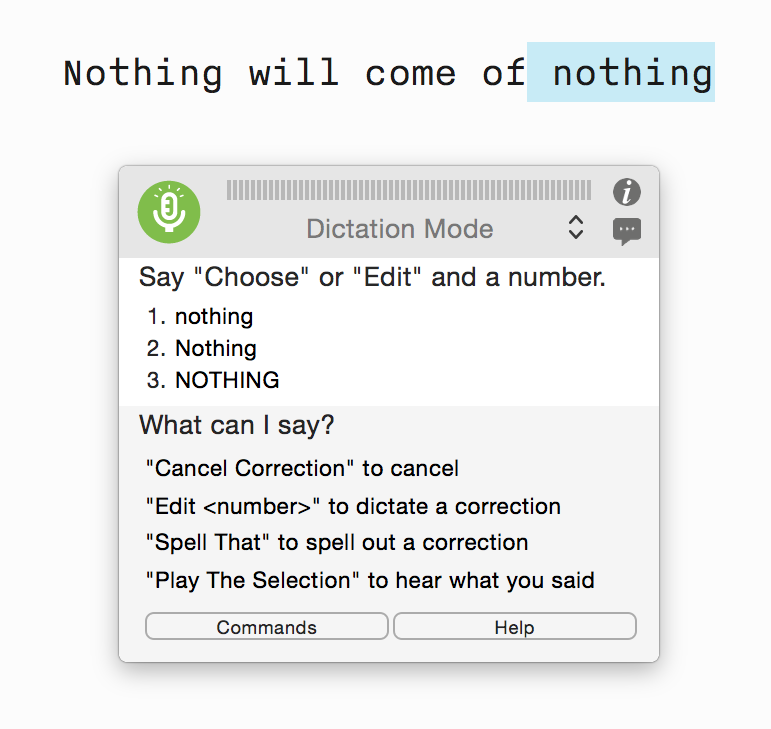 Dragon’s Voice Training helps the software learn your voice as you read some simple stories. But an even better way to improve recognition is to use the Vocabulary Training feature, where you let Dragon read documents that you have written. Dragon listens to the words you speak, but also looks at the context in which words are used. The more familiar it becomes with your specific vocabulary, and the way you order words, the more accurate it is. With “Menu walking,” you can tell Dragon to click menus, controlling any application. Say any commands in any menus, such as “Click Window Menu; Click Minimize,” for example, and Dragon executes them hands-free. One feature that will be available soon, but I have not tested, is Dragon Anywhere. 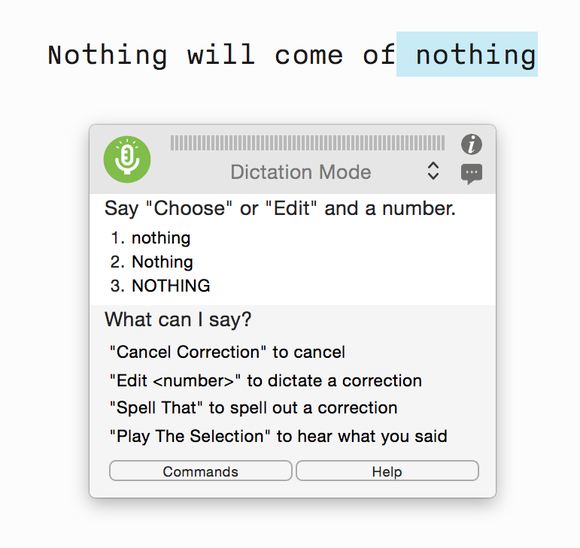 This is described as “a cloud-based app that provides continuous dictation capabilities [...] on an iOS or android device.” We’ll have more about Dragon Anywhere when it’s available. Dragon 5 has proven incredibly stable in my testing. While there were some glitches in the initial release of the software, a maintenance update seems to have fixed all the issues that I encountered. This new version offers not only improved accuracy but a much better interface that doesn’t get in the way. If you’re used to dictating, you’ll definitely want to update to Dragon 5. If you’ve never used this software before, this is a great time to check it out. The fact that you can get excellent results without buying a specific microphone makes it more affordable, and easier to use. Dragon 5 offers not only improved accuracy but a much better interface that doesn't get in the way.